Printed blouse designs are very popular these days especially with plain sarees to give a striking saree look. Prints come in various forms to suit a persons style sensibilities, they can be flirty florals or edgy bold patterns and motifs helping you make a style statement on its own. The best part about prints is that it is one cyclical trend which never seems to go out of style and infact printed blouse designs can be worn by women of all ages with slight design and pattern tweaks. The trick lies in going for subtle pairings and not overdoing it. 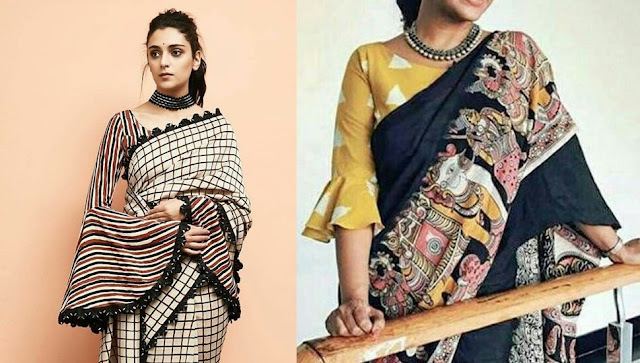 If you are starting off with printed blouse designs then begin with sober or small prints teaming them with plain sarees which makes for a striking ensemble yet making it look very effortlessly charming. Later you can move to more bold bold prints like tropical blooms, animal prints or even funky motifs. When you say printed blouses people usually assume it to be a floral printed blouse but florals are the only print available in these modern times. There are a lot of innovative prints you can try which will give even a simple cut blouse a very designer and trendy look. 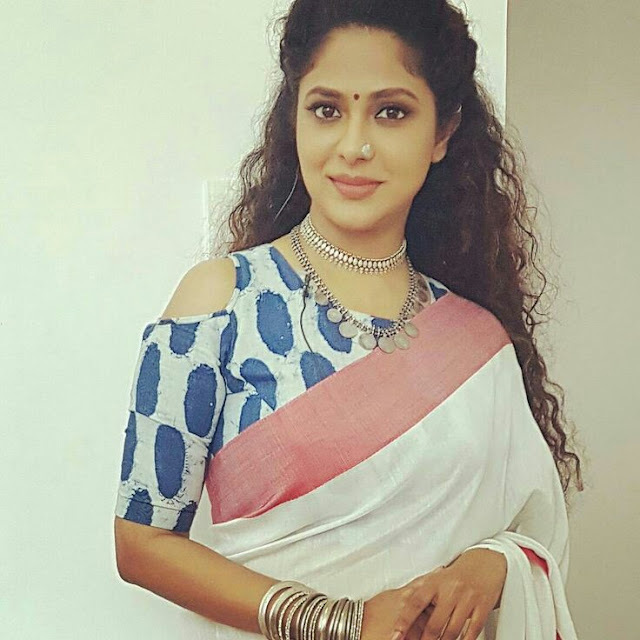 Also printed blouses are very versatile, you can pair them up with cotton sarees for work wear or pair them up with chiffon or satin sarees for party ready look. 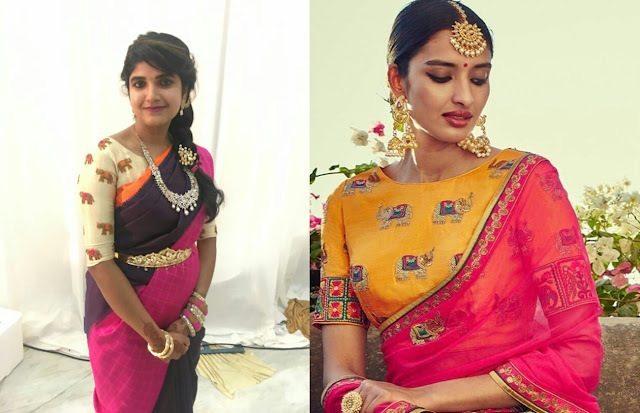 Printed sarees need not be bling free, infact they are a lot of ready to shop printed blouse designs which have a bit of embellishments to make it more special occasion appropriate. 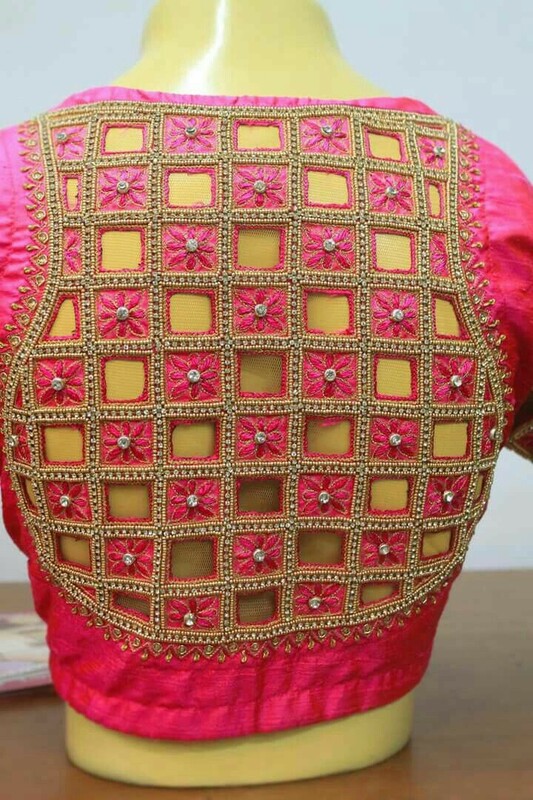 Embroidery on printed blouse designs is also a very good idea if you are looking for an outfit idea with more classy appeal. If you go by less is more mantra then floral blouse designs with boat neck blouse patterns are your best friends. Florals help you make a statement even with the simplest of sarees giving you achic ethnic look which can be flaunted at a variety of different events like brunches, cultural events, office parties and even small wedding events. For added spark accent your look with minimal yet bold jewelery, bright lip shades and open hair for stylish appeal. Add a bit of edgy to your printed blouse designs this season and let them make a statement of their own. Halter neck blouse designs spell glam like nothing else and when they are printed then it just gets more striking and fun. 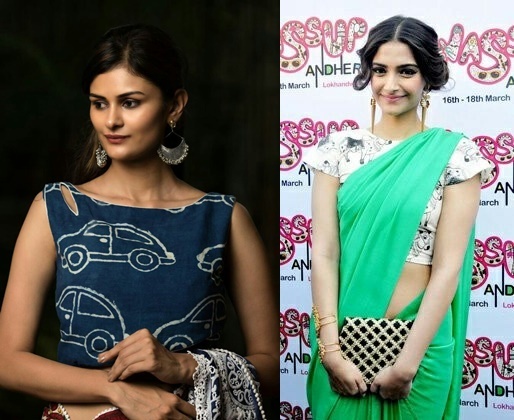 Pair your printed halter neck blouses with plain sarees for classy look or add more saas by pairing print with print. 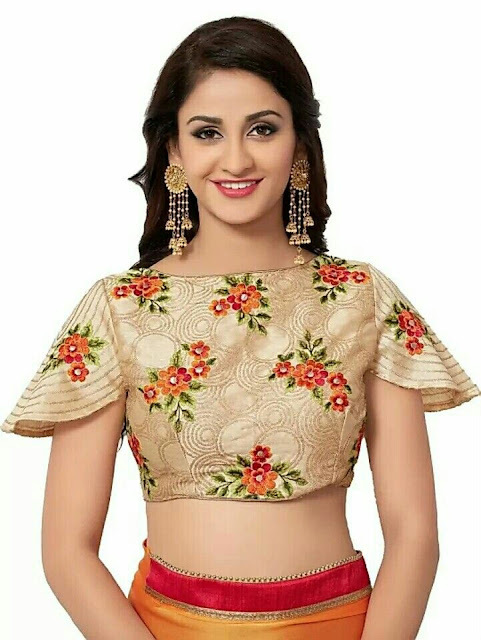 These blouse patterns an also work as lehenga blouse designs, just pair up with a contrasting coloured plain lehenga and you are srted for smaller wedding functions. Fun prints like cows, telephones , birds or even cars can help you distinguish from the rest in the most sassy edgy sort of way possible. 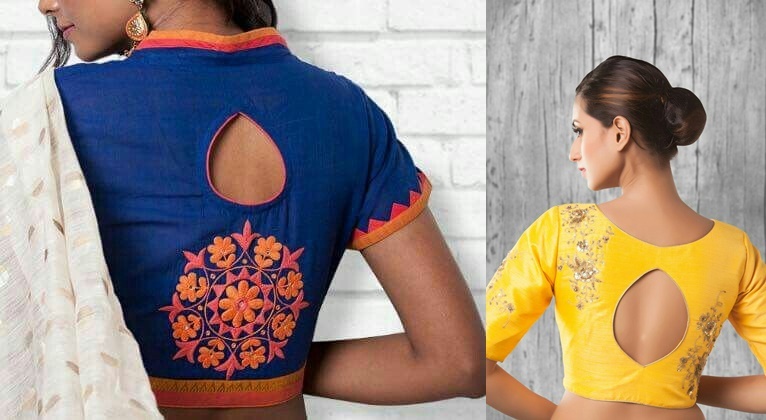 These contemporary printed blouse designs work best with fusion modern saree drapes giving you a very unique ethnic look which is going to be the talk of any event you attend. 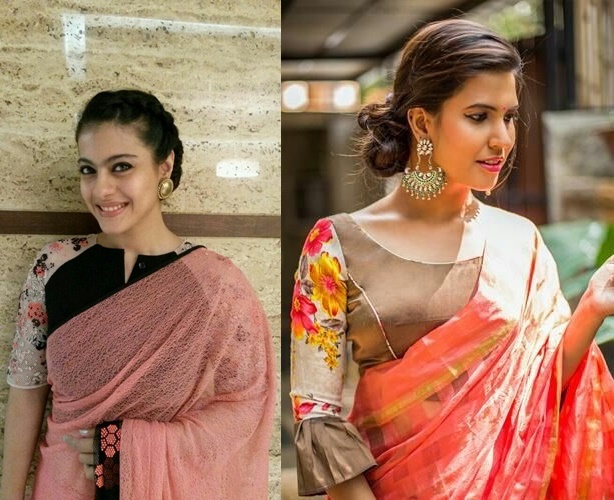 When you decide to flaunt such quirky prints make sure to keep your rest of look simple so your blouse is the highlight of your look but if you are really looking to make a statement I suggest you experiment crazy with a modern saree draping style and hit your saree look right out of the park! If the flirty and feminine floral prints are what your heart desires, this season try florals with a lace neckline twist. A chic sleeveless floral printed blouse design is all things gorgeous but an addition of sheer net or lace panel to the front neckline is going to make it more stunning giving it a total designer vibe. Pair these kind of floral printed blouses with sheer net sarees or lace sarees for festive looks appropriate for a day wedding. A printed blouse design give out a very designer vibe minus the price tag making it ideal for us common women to invest in these kind of blouses. If a full on printed blouse design seems to overwhelm you then try going for a plain blouse with printed sleeves. A plain blouse with printed sleeves brings about an aesthetic touch to your saree look giving a graceful appeal. 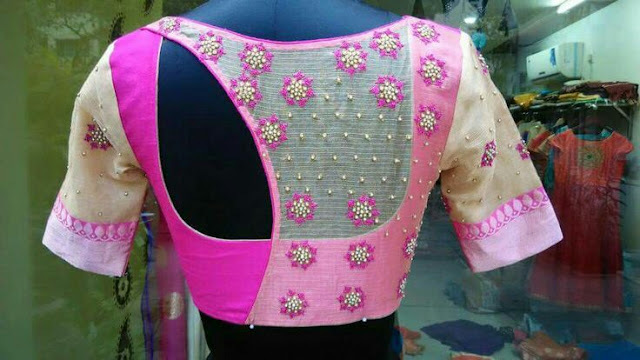 The best part is this kind of blouse can be made by any trusted local tailor yet will look totally unique and designer when you wear it. For more fashionable spin to this blouse design you can add a layer of plain frill detailing or go for sheer printed material for sleeves. 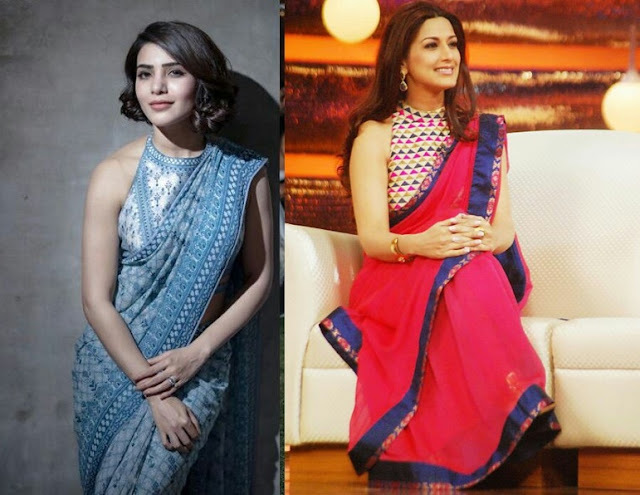 For work wear sarees stripes or checks are the acceptable prints which can be paired with simple plain sarees for professional look. Checks pattern blouses can also look trendy when you opt for the right kind of necklines. A wide U neck with piping detailing or a high neck collared blouse pattern, take your pick and add loads of elegance and class to your office look. Bell and frill sleeve patterns are currently trending and when you try this sleeve style with printed blouses it is going to look insanely good and not to mention dramatic too. 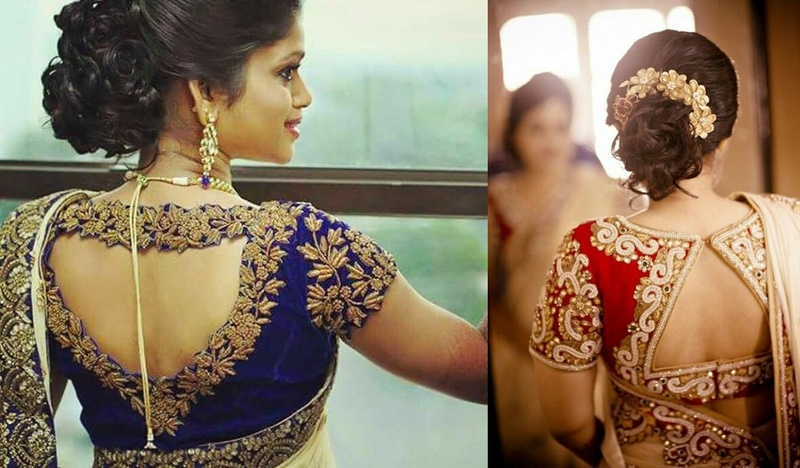 Statement bell sleeves are easiest way to look fashion forward and give your saree looks a contemporary touch. These bell sleeve printed blouse designs work well to give you an airy feel perfect for summers. 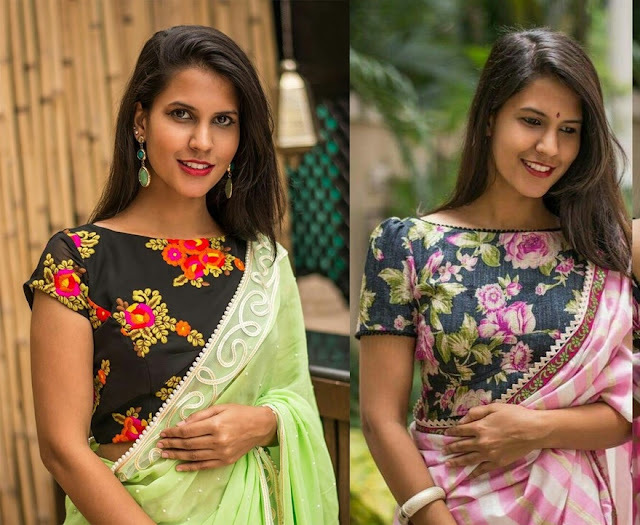 Pair these kind of printed blouses with plain sarees for everyday casual look or go all out and pair print on print for a fresh and exciting saree look ideal for small events like dinners. These kind of playful sleeves are pretty easy to carry off but if you arent comfortable then try elbow length sleeves with smaller frill detailing then move on to more dramatic bell sleeves. Since these sleeves are sizable making a statement of their own it is best to keep accessories to bare minimum for a well put together look. Printed blouse with a plain strip looks fresh, appealing and give a very designer kind of vibe. Using a printed fabric get a stylish blouse stiched by adding a plain strip on the neckline. For added chic appeal add a sleek sleek with button closure. Pair a printed blouse like this with a plain saree in contrasting colour for an elegant look. Give a new trendy spin to your plain sarees by pairing them up with printed full sleeve blouse designs. The long sleeve blouse works well for women with flabby arms especially in winters giving a very classy appeal. 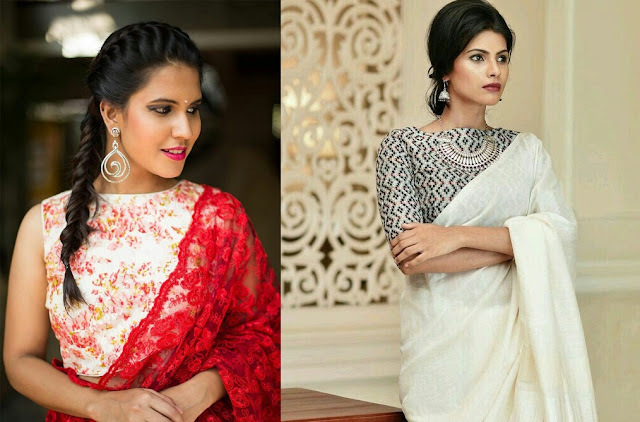 A formal saree look or even a special occasion outfit, full sleeves printed blouses make for a gorgeous pairing with plain sarees. 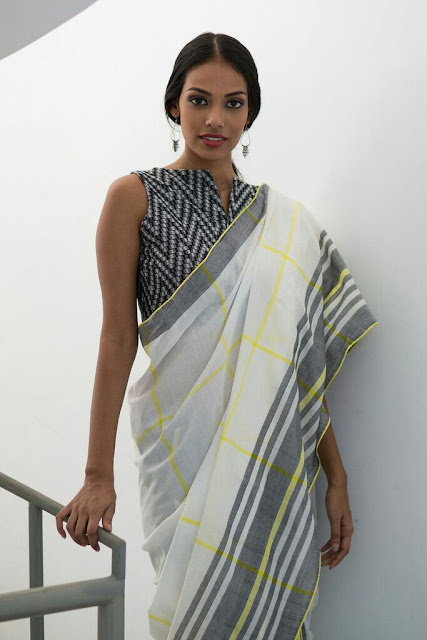 For office wear opt for subtle prints and plain cotton or handwoven sarees. For special occasions you can try more fun prints and pair with plain satin or chiffon sarees. 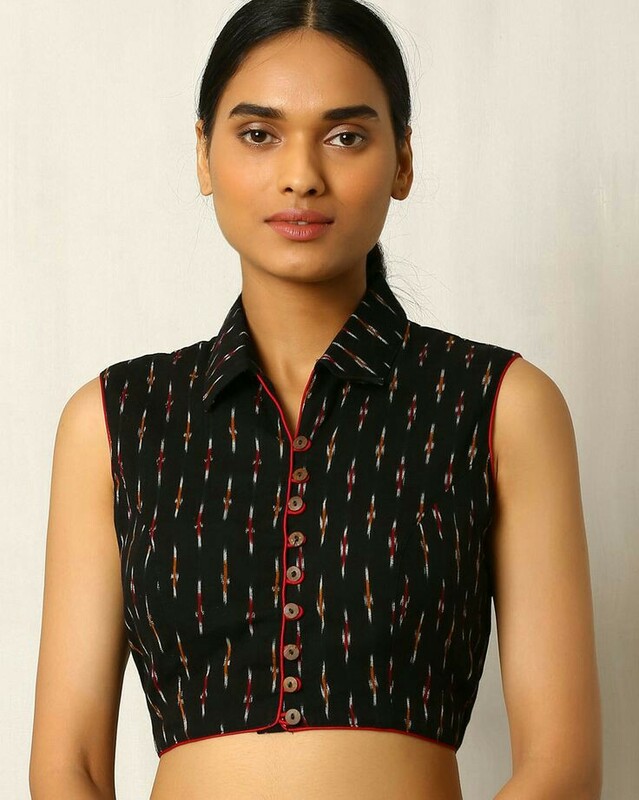 Subtle prints in collar neck pattern give a very formal vibe making is ideal for office wear sarees. This sleeveless printed blouse design has a lot going on with collar detail, contrast piping and front button closure but when paired with a plain contrast coloured saree it is going to sure make for an elegant saree attire. When prints come in high neck they not only look stylish but elegant too. 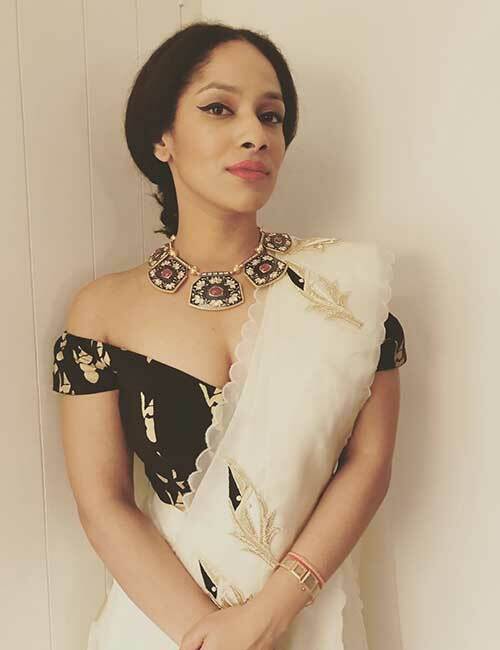 If a classy appeal is what you are eyeing with a your saree look then a printed blouse design with a high boat neck works best. 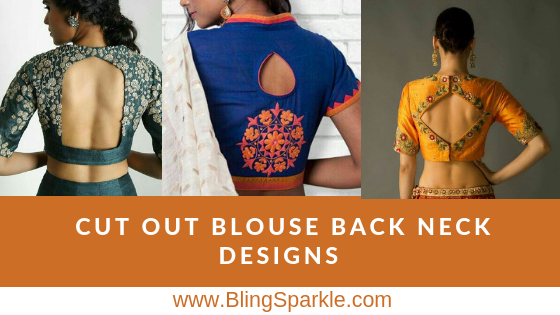 Pair these kind of blouses with sheer and lace sarees or even plain sarees for an interesting saree look which will make people sit up and take notice. 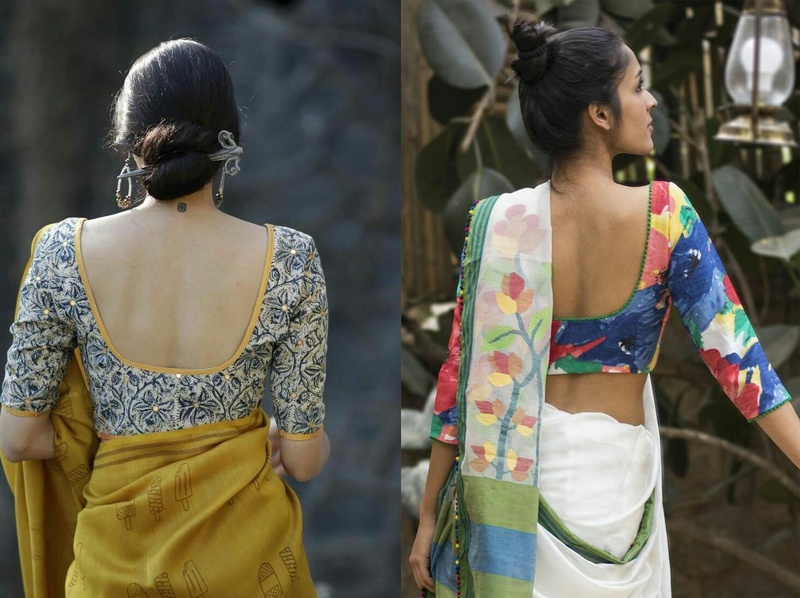 New trendy motifs and prints are gracing the world of saree blouses. 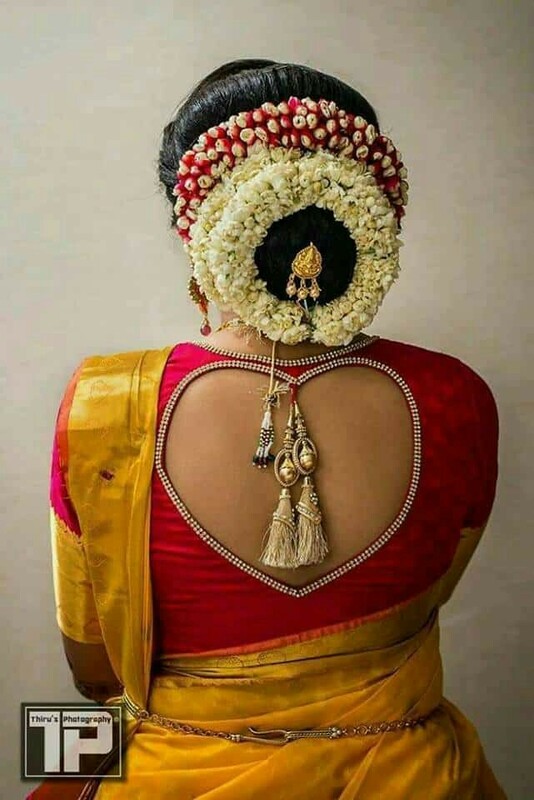 The elephant motifs which are getting is an exciting break from the same old florals and the best part is it has a traditional touch to it too. 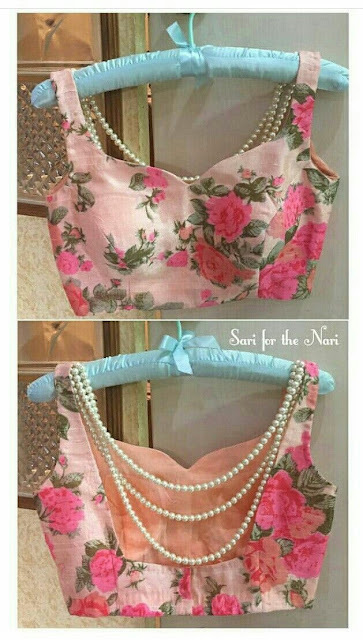 These kind of blouses can be worn by women of all ages with a bit of blouse design and sleeve tweaks. 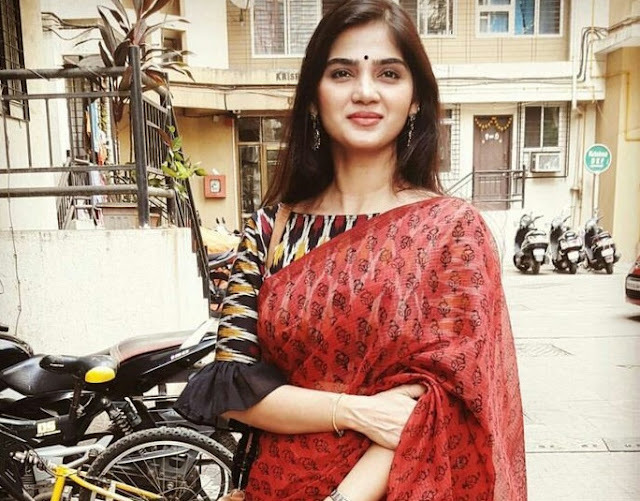 These kind of elepant printed blouse scan work well with plain sarees and even festive silk sarees for a stunning ethnic look which stand out in a crowd. Printed blouses are gorgeous but instead of going full on printed try a plain sleeve pattern this time around and watch yourself look chic and effortlessly trendy. Your sleeves can be of any length and style but make it plain and allow it to complement your printed blouse for a designer feel. These kind of printed blouses with plain sleeves work best with sheer plain sarees. A zig zag aka Aztec printed saree blouse with V style neckline works well for formal wear sarees in summers. You can go sleeveless or opt for short sleeves depending on your personal style. Give a designer spin to your modest printed blouse designs by opting for a sleek cut out on your shoulder. 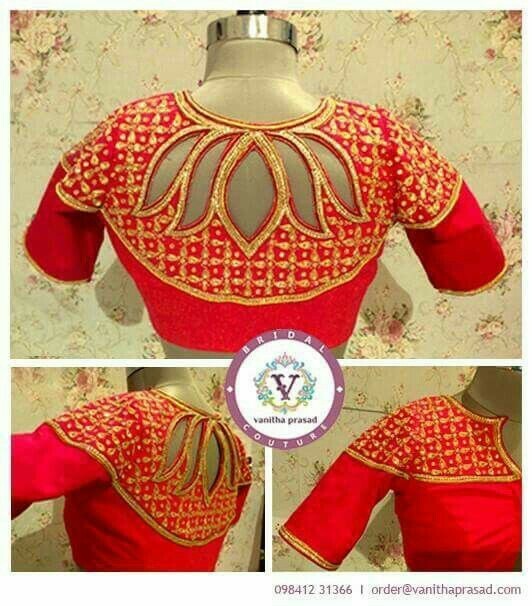 It is amazing how a simple cut out lends a designer and chic appeal to a printed blouse pattern making it ideal for special occasion sarees. 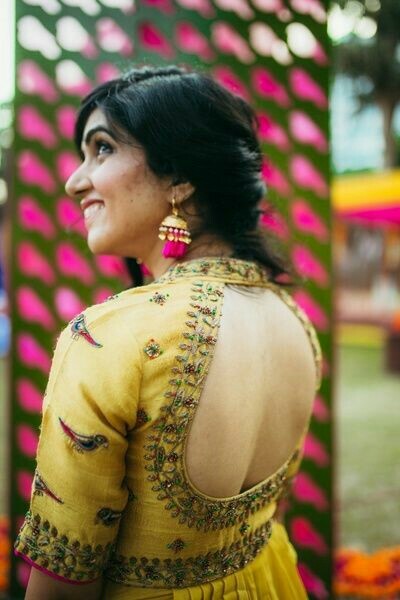 Prints can be overwhelming and if you dont want play safe then I suggest you try simple back neck pattern which will give a very polished look. A wide U cut back with contrast piping and elbow length sleeves makes for a stylish printed blouse design which you can pair with a variety of different sarees. 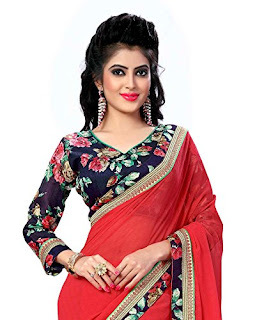 Florals are ofcourse the most popular prints which work best for festive wear sarees. 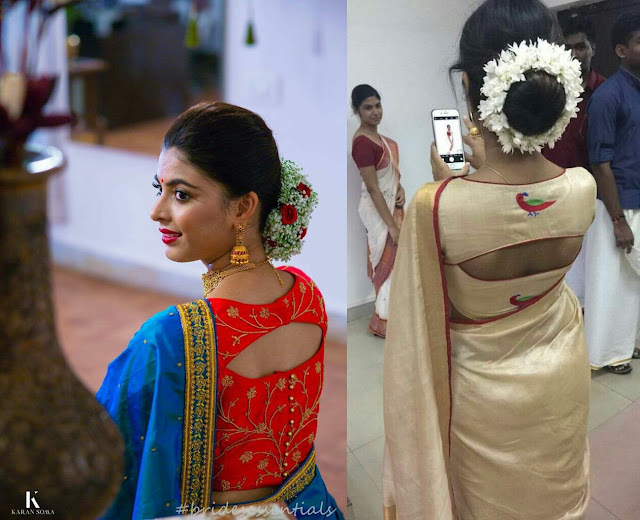 If you are planning to wear a net saree then pair with a sleeveless floral printed blouse design and add 2-3 layers of pearl strings as a back neck design detailing for a gorgeous and elegant saree look. With printed blouse designs you add in a fun element like plain piping borders or get more playful with plain frill detailing. These frill detail on printed blouse designs give a very fresh and youthful appeal to any saree look. 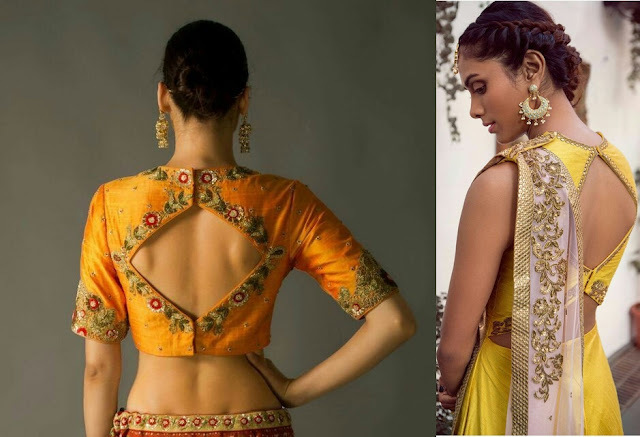 Racer back style saree blouse designs are a raging trend but you need a well toned body to flaunt these. If you are comfortable with this blouse style then try a printed version of this alluring pattern and you are sure to make heads turn kicking off a style revolution of your own. If prints are drama then a peplum cut blouse pattern adds a quirky element to your saree look making it unique and fun. These kind of printed blouse designs with peplum detail work best if you have tummy fat and you want to hide itor if you are pregnant. This style ofcourse can work well even with slim woman for an innovative and contemporary saree look. 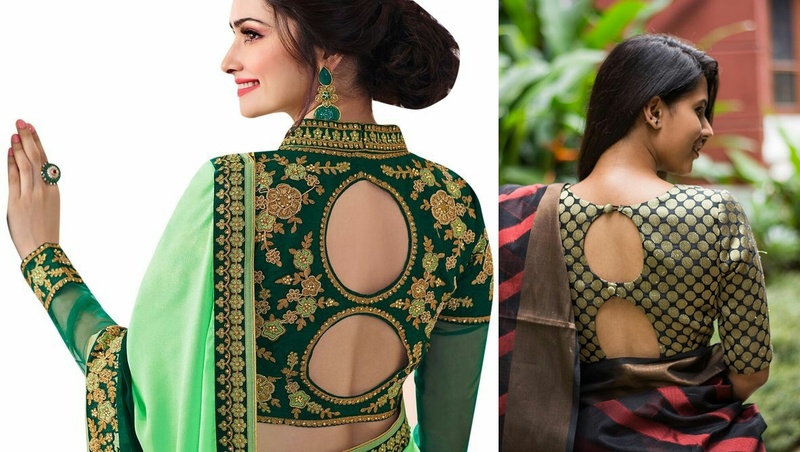 A stylish polka printed blouse design with a pretty back is sure to complement any trendy saree. The plain bow style tie up detailing is the highlight of this look which complements the print well. 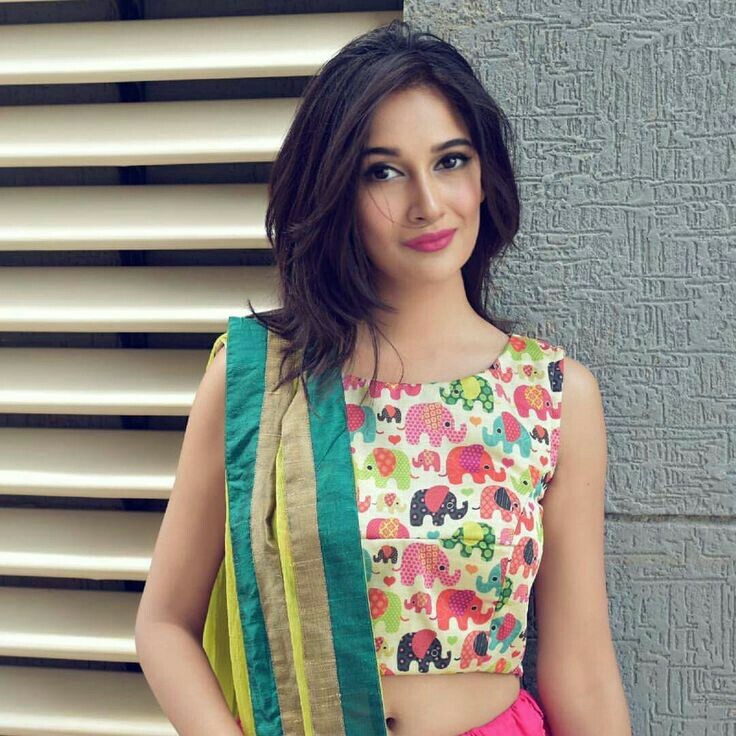 wear this style of blouse with a tie and die saree or even plain saree to stand out and grab lots of complements. Full sleeve printed blouse designs are common but have you thought about adding a sequinned or an embroidered border to sleeve? The addition of an embroidered border makes it more relevant to pair with festive sarees for an alluring party saree look. Wear this of full sleeve printed blouse designs with embellished net sarees, silk sares and sequinned Georgette sarees. Explore fun motifs if you want to indulge in printed blouse designs. This all new jhumki bell earrings print is a rage and is sure to grab eye balls. Get a simple cut blouse made from a fun print like this and add sequined borders or pair with festive sarees for wedding appropriate ethnic outfit. 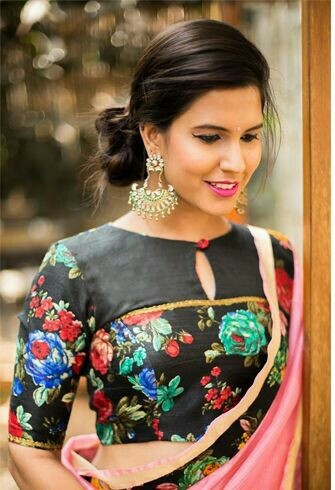 You can try chand bali prints too which another hot new trend. If you are aiming for a fusion saree look opt for a western style printed blouse design and pair up with a plain saree. This polka dotted flared blouse with short boat neck is all things fabulous, stylish and cute. 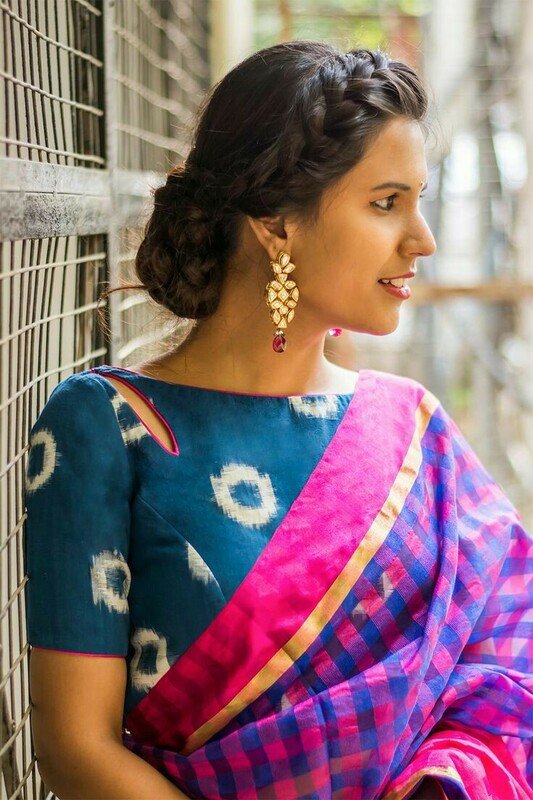 Give this kind of blouse pattern a try for occasions like cocktail parties or sangeet night and go for minimal styling and a crisp pinned pallu drape for added sophistication. Look at this stunner of a blouse. It speaks for itself! 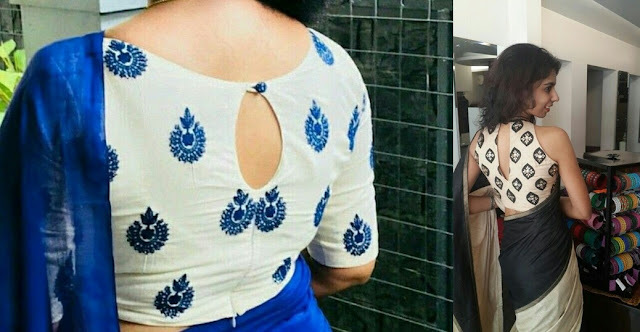 This kind of blouse pattern is not for everyone but if you are the experimental fearless kind why settle for anything less? Go all out and hit it out of the park with this head turner of a blouse design which is going to elevate you into an overnight fashionista. Off shoulder blouses are glam and contemporary chic. 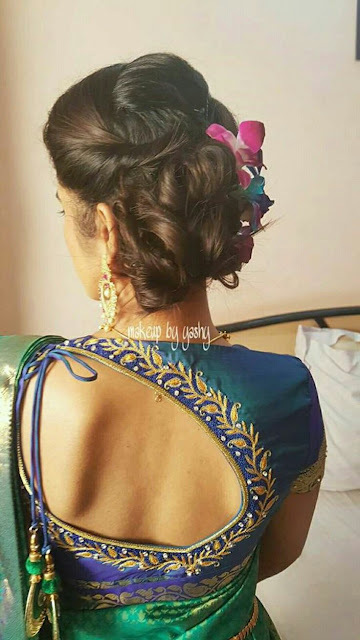 If you want a very modern appeal with your saree then try a printed off shoulder blouse design. Prints and off shoulder are such an incredibly amazing combination which is sure to draw loads of attention at any event you attend. Cold shoulder blouse designs are a raging hot trend and there is no reason why you cant try this style with printed blouses. 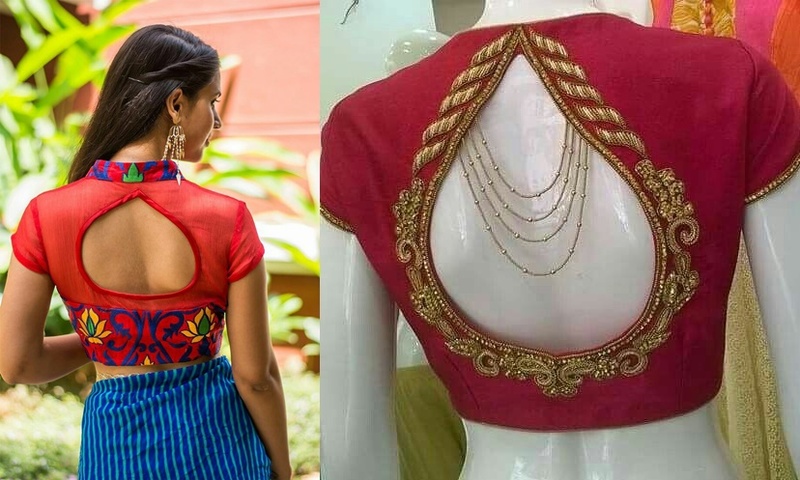 Spice up your simple patterned printed blouse design by adding a cut out at shoulder for a stylish saree look. old shoulder infact is bound to look more pronounced and striking with printed blouses rather than plain blouses but you need to make sure to opt for subtle or sober prints otherwise it will look very crowded and tacky. For professional saree look printed blouses are a boon. 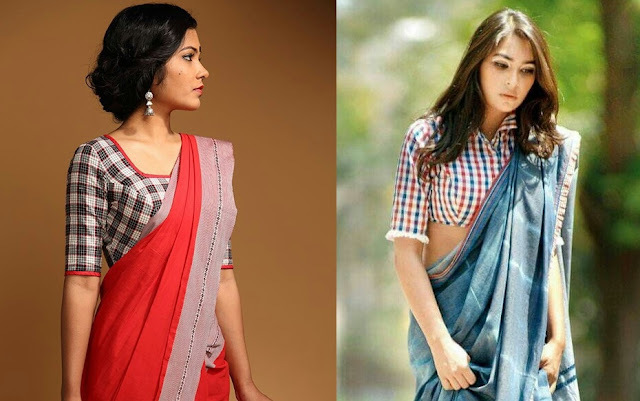 These printed blouses pair well with cotton sarees giving a formal look which is both comfortable yet stylish. Working women can try plain sarees or handloom and cotton sarees which can be effortlessly paired with printed blouses for an elegant saree look. Florals are a rage and if you want to go festive with a printed blouse design bright and cheery floral prints are your best bet. You add a bit of sequins to your floral print blouse borders to make it more wedding appropriate and pair it with embellished net sarees for a incredibly stunning festive saree look. To add variety you can get your floral printed blouses stichched with different sleeve lengths or go for trendy new sleeve styles like bell sleeves, cold shoulder, frill or even plain conttrast sleeves with floral printed blouse. 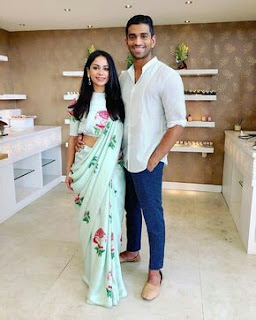 Going sleeveless is another summer appropriate design idea for floral printed blouse designs especially if you plan to team it with sheer sarees for day time events. 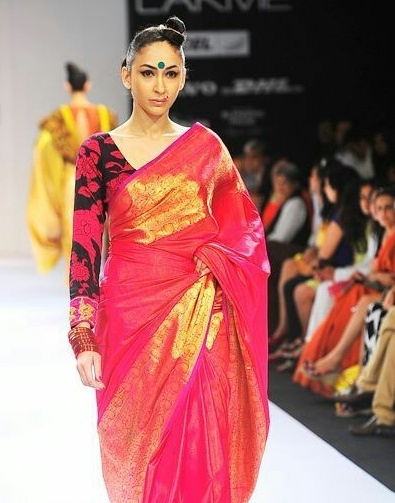 If you want to add a bit of quirky in your ethnic look teaming sarees with offbeat printed motifs is a fool proof idea. Fun prints like cows, jhumkis, cars etc (refer design no 13, 34, 3 ) have the ability to make even simple saree look uber cool and interesting. 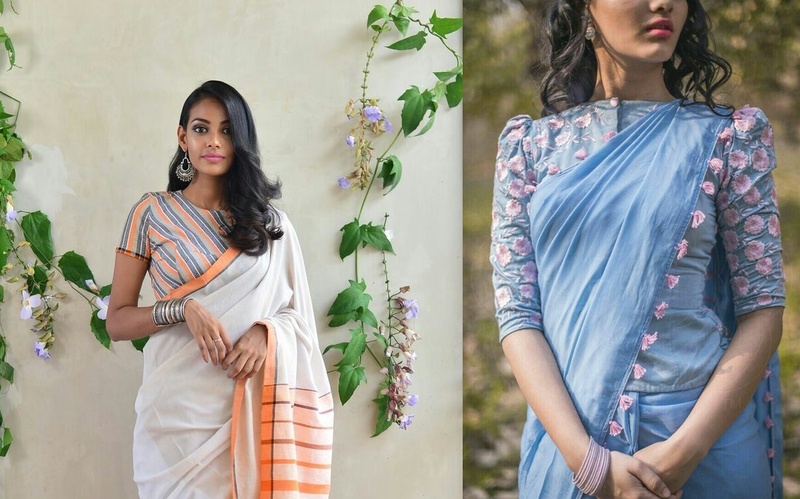 If these offbeat prints are too much of creative experiments for you try something more traditional like chand bali prints, kalamkari or even elephant print. Geometric print is also a good idea if you are looking for office wear appropriate print. 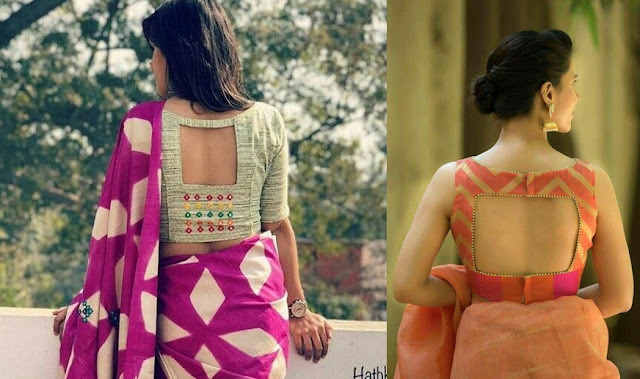 For festive sarees a normal printed blouse design is just not going to make the cut. You have to get more innovative and creative adding interesting details to your printed blouse to give it a very high fashion designer appeal. 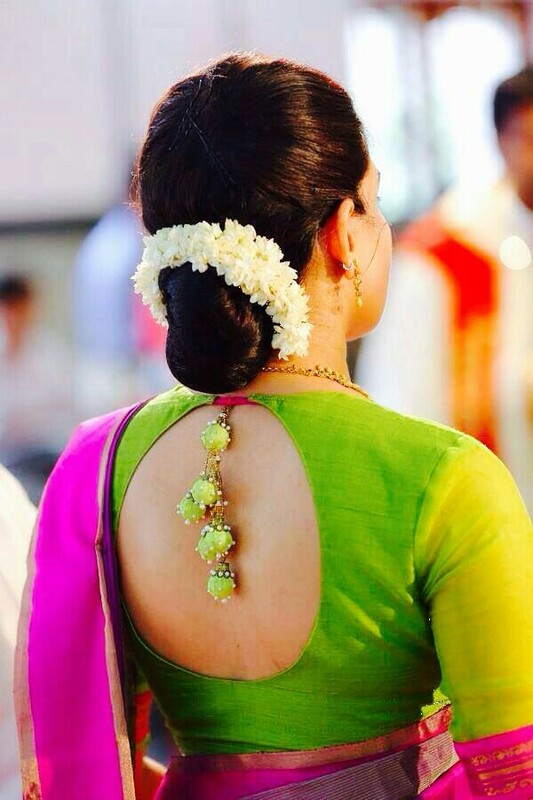 A floral printed blouse sheer neckline (refer design no 4 )will make for a pretty striking picture at weddings. 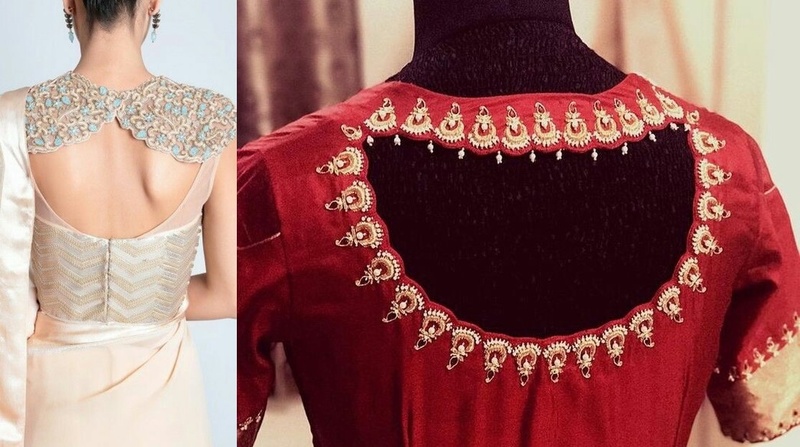 More details like embroidered or sequined borders (refer design no 27 and 30 ), keyhole front neckline (refer design no 32 ) or bell sleeves will look alluring and unique making for an attention grabbing pattern. 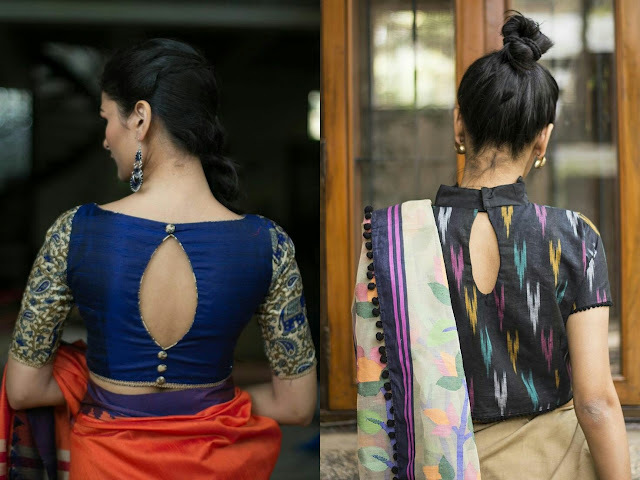 Which of these printed blouse designs with trendy neck patterns are you looking to try ?